The film deals directly with the Vietnam War as seen through the eyes of United States President Lyndon B. Johnson and his cabinet members. The starting events portrayed begin in 1965. 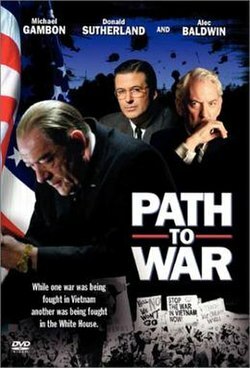 The film stars Michael Gambon as President Johnson, Alec Baldwin as Secretary of Defense Robert McNamara and Donald Sutherland as presidential advisor Clark M. Clifford, who succeeds McNamara as Secretary of Defense. Curtis L. McClarin Martin Luther King, Jr.
Maxwell D. Taylor is the American ambassador to South Vietnam. Norman Morrison is a pacifist who immolates himself. Earle Wheeler's nickname in this movie is "Bus." Television critic Matt Zoller Seitz in his 2016 book co-written with Alan Sepinwall titled TV (The Book) named Path to War as the 6th greatest American TV-movie of all time, writing: "This nearly three-hour epic plays like the greatest political drama that Oliver Stone never made.... This is easily the greatest of Frankenheimer's late-period TV work, which equals his finest work from the 1960s". Sutherland won a 2002 Golden Globe Award for Best Supporting Actor – Series, Miniseries or Television Film for his performance as Clifford. ^ Sepinwall, Alan; Seitz, Matt Zoller (September 2016). TV (The Book): Two Experts Pick the Greatest American Shows of All Time (1st ed.). New York, NY: Grand Central Publishing. p. 372. ISBN 9781455588190. TELEVISION/RADIO; A Vietnam War Film Takes On a Sudden Resonance by Bernard Weinraub, 9 December 2001, The New York Times. LBJ's tortured 'Path to War' / HBO movie shows two sides of Johnson in Vietnam era, by Jonathan Curiel, San Francisco Chronicle, Saturday, 18 May 2002. Path to War, by Lesley Smith, PopMatters, 10 June 2002. This page was last edited on 4 September 2018, at 19:05 (UTC).